These healthy peanut butter banana cookies are full of oats, peanut butter, and sweet chocolate chunks! With no flour or butter in these cookies, these peanut butter banana cookies are a guilt-free dessert! After strawberry pie, fudgy brownies, chewy sugar cookies, rice krispie treats, and cake (the latter 3 left over from a party), it was time to cut the junk for a few days and bring in a healthy dessert (because I can’t cut the dessert completely). You’re probably thinking, who are you and what have you done with the real Michelle? It’s a little unusual for me to post super healthy recipes, but I’m a baker, and when I find something that tastes good, who am I to judge if it’s made without butter or flour? It’s healthy and gluten-free! These cookies are a cross between a cookie and a chewy granola bar. Don’t you love those Quaker Oat chewy granola bars? Especially the s’mores kind?! Of course, I love all things s’more, but those bars are top-notch for pre-packaged food. Anyway, getting back to the point–the cookies. Okay, so these cookies are delicious for being so healthy. Isn’t it the worst when you eat something healthy that literally tastes like cardboard? Here you are, trying to be good with your food choices, and your reward is eating tasteless, gritty sand. Thankfully, these cookies provide a perfect combination of health with flavor. They allow you to still have your sweet tooth fix without worrying about how much sugar, flour, or butter you just consumed. Plus, these are packed with protein so they’re great as a pre or post workout snack. Or, a good on-the-go breakfast. 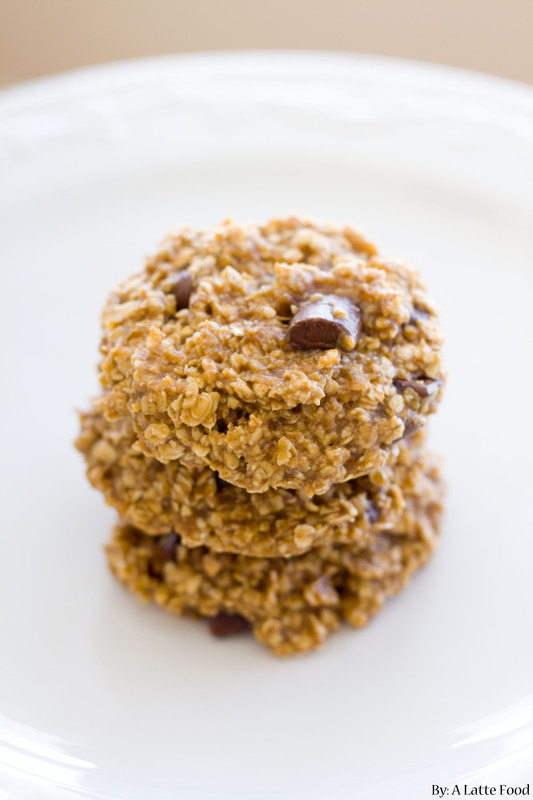 These cookies begin with ripe, mashed bananas, peanut butter, and oats. These 3 ingredients replace the flour, butter, and eggs that are in traditional cookies. Now, to sweeten these cookies I used a combination of cinnamon, vanilla extract, honey, pure maple syrup, and brown sugar. Once mashed, add in peanut butter and mix until well combined. Add in maple syrup, honey, brown sugar, vanilla, salt, and cinnamon and mix well. Next, add in oats. Stir until well combined. Lastly, add in chocolate chunks and mix. For 9 large cookies, use 2-3 Tbsp of dough. The dough will be sticky, but do your best to form the dough into a cookie shape because the dough will not spread out. love the flavour combo + how relatively guilt free these cookies are. awesome recipe! Can i use peanut butte granola in place of oats and peanut butter?? This sounds really good! Chocolate, banana and oats are a great combo! Also, I do love those chewy Quaker Oats bars (well, when I was a kid, I don’t eat them much anymore!) So if these are anything like those than I’ve got to try them! Thanks for sharing this recipe! I’m always down for a healthy dessert! I haven’t really baked for a long time and made these today! They were so yum & I made exactly 9 cookies as per your recipe so it was spot on! Especially given I am based in the UK so it was fab the measurement conversions turned out nicely.